to efficiently get you around Raleigh, NC. Complimentary with your next 2018 Sentra is our Family Plan worth over $3,000! 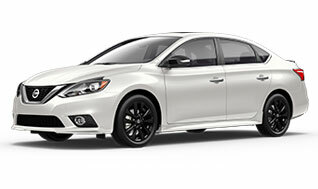 The more you drive in North Carolina, the more you save with lifetime oil changes, lifetime powertrain warranty, lifetime car washes & even more..
Safety is key in the new Nissan Sentra with the Tire Pressure Monitoring system, available Vehicle Dynamic Control just to name a few that will surely get you safely around Asheville. Plus, with 37 MPG highway, your next road trip will leave you with a happy wallet. Comfort tailored to you, the Nissan Sentra has a standard drive computer feature and available dual zone auto climate control along with heated front seats and spacious leg room. Plus, with new 60/40 split rear seats & extra cargo space, your trips are unlimited! Technology is endless in the Nissan Sentra with available NissanConnectSM which integrates mobile apps, navigation, music and more. Available Siri® Free Eyes allows you to easily get around North Carolina while blasting your 8 speaker Bose® sound system.